Does Screening for Pain Correspond to High Quality Care for Veterans? Routine numeric screening for pain is widely recommended, but its association with overall quality of pain care is unclear. To assess adherence to measures of pain management quality and identify associated patient and provider factors. One hundred and forty adult VA outpatient primary care clinic patients reporting a numeric rating scale (NRS) of moderate to severe pain (four or more on a zero to ten scale). Seventy-seven providers completed a baseline survey regarding general pain management attitudes and a post-visit survey regarding management of 112 participating patients. We used chart review to determine adherence to four validated process quality indicators (QIs) including noting pain presence, pain character, and pain control, and intensifying pharmacological intervention. The average NRS was 6.7. Seventy-three percent of charts noted the presence of pain, 13.9% the character, 23.6% the degree of control, and 15.3% increased pain medication prescription. Charts were more likely to include documentation of pain presence if providers agreed that “patients want me to ask about pain” and “pain can have negative consequences on patient’s functioning”. Charts were more likely to document character of pain if providers agreed that “patients are able to rate their pain”. Patients with musculoskeletal pain were less likely to have chart documentation of character of pain. Despite routine pain screening in VA, providers seldom documented elements considered important to evaluation and treatment of pain. Improving pain care may require attention to all aspects of pain management, not just screening. Pain is a common debilitating condition. Approximately 20% of patients and 25% to 50% of community-dwelling elders experience chronic pain.1,2Although many studies have identified under-treatment of pain,1, 2, 3 few have examined why providers vary in responding to patient-reported pain.3,4 Such information would help inform more successful approaches to pain management. Moderate to severe pain, measured by a score on the NRS between four and ten, should typically trigger a comprehensive pain assessment and prompt intervention.5 However, one study at a single VA medical center, found that routine pain screening did not change provider medication management.3 That study occurred soon after implementing the 5th vital sign, using a pre-post design and did not examine the extent to which providers utilized the NRS for pain evaluation and management. This study builds on earlier work in developing an assessment across multiple sites with established NRS procedures and examines multiple processes of care, from assessment of pain to treatment. We examined indicators of four key processes of pain evaluation and management in a regional cohort of facilities where routine pain screening was implemented during the last 10 years. We estimated adherence to these indicators and examined patient and provider factors associated with these processes of care. The Helping Veterans Experience Less Pain (HelpVets) study is a VA-funded cross-sectional cohort study designed to evaluate adherence to basic pain care management. We conducted the study from March 2006 to March 2007 in primary care, oncology, women’s health and cardiology outpatient clinics at two VA hospitals and six associated clinics in the VA Greater Los Angeles Healthcare System. The baseline survey asked patients about the degree to which pain was discussed during the nurse and provider visits, current treatment regimens and general quality of life issues. We asked all providers (n = 260) in relevant clinics to complete a baseline survey about attitudes, beliefs, and practices prior to patient interviews. Of those approached, 209 (74%) completed surveys. This study includes 77 providers (45 staff physicians, nine fellows, five house staff, 14 nurse practitioners and four physician assistants) who cared for 140 patients in the analytic sample. Of the 77 providers, 57% had one patient, 17% had two patients, 14% had three patients, 10% had four patients and 1% had five patients. After the patient visit, providers were asked to complete a post-visit survey that assessed provider’s perception of, and discussion about patient’s pain as well as whether they initiated or intensified a pharmacological intervention. If applicable, we queried about reasons for not changing treatment. Sixty-five of the 77 providers completed post-visit surveys for the 140 patients in the initial analytic sample, yielding valid post-visit provider data for 112 patients. Data elements for all four indicators were abstracted from clinic notes in the VA’s electronic medical record (Computerized Patient Record System or CPRS) by one, experienced abstractor. To assure accuracy, the abstractor reviewed questionable records with physician investigators. We obtained pharmacy data from the regional data warehouse to supplement medical record estimates of pain regimen alteration. We identified pain medications dispensed within 90 days before and 90 days after each study visit. Of the 747 total prescriptions dispensed, 282 prescriptions were 24 unique agents used to treat pain including: acetaminophen, non-steroidal anti-inflammatory drugs (NSAIDs), anti-seizure medicines used for analgesia, opioids and topical analgesics. A Ph.D. data abstractor characterized each prescription for each patient based on days of supply, dose, instructions and frequency of dispensing during the study. Increases in any of these factors resulted in an “increase” rating, while a decrease in any factors received a “decrease” rating. Prescriptions that remained consistent received a “no change” rating. After reviewing all medicines, each patient received an overall rating of “increase”, “decrease”, or “no change”. A physician over-read 10% of all characteristics and to resolve any clinical difficulties that the abstractor faced. Of note, the available pharmacy data did not include non-VA pharmaceutical use. The Theory of Planned Behavior by Azjen and Fishbein explores the relationship between beliefs, attitudes, intentions and subsequent behavior.10 It postulates that a person’s attitude toward performing a behavior influences intent as do beliefs about the behavior by persons(s) who are important to the individual.11, 12, 13 This theoretical model helps explain how provider beliefs, attitudes, and intentions may be important in understanding feelings about the NRS and responses to a moderate to severe pain rating. Provider attitudes toward a behavior (shaped by beliefs), subjective norms (determined by social standards), and provider perceived behavioral control about documenting and treating pain were all key constructs in evaluating determinants of pain management. However, it was infeasible to collect some variables in the framework and they were omitted from this analysis. The four quality indicators (QIs) evaluating pain assessment and management were adapted from the Assessing Care of Vulnerable Elders (ACOVE)14, 15, 16, 17, 18 and Quality Assessment (QA) Tools measurement sets.19,20 Specifically, the four stem from the following recommendations for patients with moderate to severe pain on the NRS: 1. evaluate the presence or absence of pain; 2. evaluate the character of the pain; 3. note the degree of pain control; and 4. initiate or intensify pain treatment. We assessed the degree to which providers adhered to each individual quality indicator, leaving interpretation deliberately liberal to meet the intent of the indicators. For example, any documentation of pain (or absence of pain) in the progress note met the first quality indicator. The character of pain included many terms such as type (e.g., throbbing, intermittent), location, and/or mitigating or worsening factors. General statements about improvement or stability of pain symptoms satisfied evaluation of pain control. Pharmacy prescriptions were carefully examined for initiation or intensification of pain management; we also assessed progress notes for advice on current prescriptions or over-the-counter medication(s). 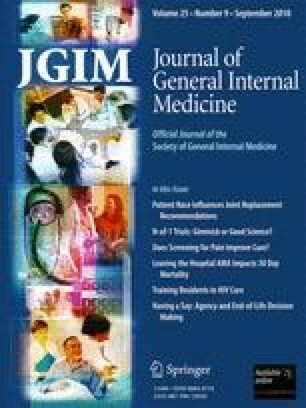 Provider attitudes toward pain management were measured by seven items with 5-point Likert response scales (strongly disagree to strongly agree): “patients are able to rate their own pain intensity on the 0–10 scale”, “0–10 pain ratings by nurses accurately reflect the patient’s pain intensity”, “my patients want me to ask about their pain problems”, “pain medication should be given when pain is severe”, “pain can have negative consequences for a patient’s functioning”, “when reviewing patient’s vital signs, I pay attention to their 0–10 pain score”, and “patients are more satisfied when I address their pain concerns.” We also queried about the percentage of provider’s outpatients with painful conditions and collected information about the provider’s race. We controlled for substance abuse or musculoskeletal pain, and for patient age and race. The post-visit analytic variables included dichotomous questions (yes or no responses) that asked whether during the visit the provider: (1) noticed the nurse’s NRS; (2) thought the patient was in pain; (3) talked about the symptom of pain; (4) had reasons for not discussing pain, as applicable (four different reasons); and (5) reasons for not initiating or intensifying treatment (five options). Institutional Review Board (IRB) approvals were obtained by the VA Greater Los Angeles Healthcare System and the VA Long Beach Healthcare System. We performed weighted bivariate logistic regressions to measure associations of the provider baseline variables with the four quality indicators. All associations with p-value <0.10 were included in multivariate analyses. We employed weighted logistic regressions fitting nested models by sequentially adding blocks of variables in StataSE 10.0. In each model, we first entered the block representing the provider attitude variables because we felt those variables were, conceptually, the most important for predicting the quality indicators. We then added a second block containing variables for two diagnoses (substance abuse and musculoskeletal pain), as these were previously identified as potential barriers in responding to pain. Patient and provider demographic variables (patient race and age, provider race) were added into the model last. The nested models were performed as a sensitivity analysis to confirm our model. We report the “full” model containing all variables. In addition, we examined whether there were differences in provider reporting and medical record documentation by evaluating the percent of patients who received initiation or intensification of treatment (based on chart review) and compared that information to responses on the provider post-visit survey. All analyses were weighted for patient survey non-response based on age, race, general health, cognition score, and adjusted for over-sampling of persons in fair to poor health. No adjustment for clustering by provider was needed given minimal variation in the number of patients per provider, with 74% of providers having one or two patients. Most patient participants were non-Hispanic white (46.1%), African American (28.2%), or Hispanic (19.0%). Their mean age was 59.2 years and 95% were male. On chart review, 65 (46.1%) had a diagnosis of substance abuse and 90 (64.2%) had a diagnosis of musculoskeletal pain. On average, providers estimated that 40% of their patients had pain. Provider beliefs regarding pain are presented in Table 1. Of the 140 patients who reported moderate to severe pain, the average pain score was 6.7. Table 2 presents scores for each quality indicator; Table 3 presents multivariate analysis. The presence of pain noted? The character of the pain noted? The degree of pain control? Providers were more likely to document the presence of pain if they believed that: “patients are able to rate their own pain intensity” (OR = 2.02, p = 0.01), “patients want him/her to ask about pain” (OR = 3.49, p = 0.01) or if “pain medications should be given when pain is severe” (OR = 3.17, p = 0.01). Providers were also more likely to document pain presence if they perceived a “pain rating as an important vital sign” (OR = 1.82, p = 0.01) and “patients were more satisfied when they address pain concerns” (OR = 2.41, p = 0.02), but less likely to document pain for patients with substance abuse history (OR = .399, p = 0.02). In multivariate analysis (Table 3), two provider attitudes were significantly associated with the notation of pain presence: “patients want me to ask about pain” (OR = 4.20, p = 0.04) and “pain has negative consequences on patient functioning” (OR = 7.10, p = 0.01). In bivariate analysis, documentation of pain character was found less often for patients who had a diagnosis of musculoskeletal pain (OR = 0.25, p = 0.01). In multivariate analysis, “patients are able to rate own pain intensity” was associated with better performance of pain character being noted (OR = 2.48, p = 0.05); those with musculoskeletal pain were less likely to have the character of pain documented (OR = 0.22, p = 0.05). The model was significant (χ2 = 29.12, p = 0.01). In bivariate analyses, the following were associated with noting degree of pain control: provider’s perception that patients could “accurately rate their pain intensity” (OR = 2.03, p = 0.01), the need for providing “pain medications when pain is severe” (OR = 2.83, p = 0.01), pain having “negative consequences on patients’ functioning” (OR = 3.75, p = 0.01), and paying “attention to 0–10 pain scores when reviewing patient vital signs” (OR = 1.82, p = 0.04). Patient age was inversely associated with documenting pain control (OR = 0.98, p = 0.10). These relationships did not persist in multivariate analyses. Performance on this indicator was not significantly associated with any of the provider attitudes or other variables in either bivariate or multivariate analyses. Providers completed at least part of the post visit survey following 112 (80%) of patient visits. Providers reported they noticed the NRS during 67% of visits and in 64% of visits reported the patient was in pain. While medical record and pharmacy data review found documentation of treatment intensification in just 15% of visits, providers self-reported initiating or intensifying treatment at 48% of the visits. Thus, agreement between the two sources was poor (kappa = 0.076, 95%CI = −0.1, 0.25). Providers gave various reasons for not initiating or intensifying treatment for 40 such patients. The most common reason was that “the patient preferred not to change his/her current approach” (56%) followed by “everything has been done” (34.7%), “patient not experiencing pain” (26.0%), “patient misusing pain medication” (8.5%) and “patients not responding to previous treatments” (5.4%). We found that among patients who reported moderate to severe pain at an appointment, providers often noted the presence of pain but did not clinically evaluate it further or modify pharmacologic treatment. Provider attitudes were weak predictors of adherence to quality indicators, although some provider attitudes toward the NRS were correlated with QI adherence. Similar to prior studies, 3,6,25 our results question whether the 5th vital sign has substantively improved pain assessment and management. More notably, Mularski et al.3 reported that NRS implementation did not change visit-associated pain documentation or treatment intensification. Our results extend previous work in three ways. First, our indicators were closely adapted from ACOVE14, 15, 16, 17, 18 and were subjected to a rigorous development process. As such, the quality indicators allowed us to more broadly measure processes of care (i.e., notation, character and severity of pain). Second, Mularski et al.3 conducted their study between 1999 and 2001, soon after the institution of the NRS when providers were perhaps not familiar with it. Our results, a decade later, suggest the screening tool still has had limited impact on pain management. Third, our work extends Mularski’s findings from a single VA site to multiple sites. Why the 5th vital sign has not produced more substantive improvements is unclear. One possibility is the NRS does not accurately represent pain levels or that providers do not perceive it as accurate, and hence do not act based on the rating scale. Indeed, 12% of providers disagreed or strongly disagreed that “patients are able to rate their own pain intensity on the 0–10 scale” (Table 1), suggesting concern with the tool. Another possibility is that providers do not approach pain evaluation uniformly. Chronic pain patients are vexing for many providers22, 23, 24, 25, 26 and the subjective nature of pain likely adds to variance in addressing it. While rating pain numerically may create a standard measurement, it may not yield a standardized approach to its subsequent evaluation and management. Further research is needed on variations in pain management but, in the meantime, providers and patients might benefit from clinical decision support tools (e.g., clinical reminders) within CPRS. Our study provides greater understanding of how the 5th vital sign and providers’ attitudes toward pain influence the quality of pain care. We found that simply implementing the NRS does not necessarily improve subsequent pain evaluation and management, as measured by four standardized quality indicators. Future research should examine what additional provider factors are associated with meeting the quality indicators and consider assessing non-pharmacologic interventions. Focused research could include bolstering the 5th vital sign beyond categorizing pain at one point in time; for example, additional screening question(s)31, 32, 33 might address whether a patient’s current regimen provides sufficient pain control. Whether adding such screening questions would improve pain management is unknown, but it appears that using the NRS scale alone does not guarantee high quality pain management. Funded by the VA HSR&D 11R #03-150 and Associated Health Professions Postdoctoral Training in Health Services TPP 65-007. Dr. Zubkoff was a Health Services Fellow at the Greater Los Angeles Healthcare Veterans Affairs during the time of this study and has since relocated to the New England Healthcare Engineering Partnership at the White River Junction Veterans Affairs. Pain Assessment: The Fifth Vital Sign. Available at http://www.rn.ca.gov/pdfs/regulations/npr-b-27.pdf Accessed February8, 2010. VHA Directive 2003-021: Pain Management. 2003. Available at http://www1.va.gov/geriatricsshg/docs/PainManagement.pdf Accessed February 8, 2010. JCAHO Standards for Pain Management. Available at http://www.texmed.org/Template.aspx?id=2392 Accessed February 8, 2010. Pain as the 5th Vital Sign Toolkit. Available at http://www1.va.gov/pain_management/docs/TOOLKIT.pdf Accessed on February 8, 2010.